Gotta love those quick and easy sketches! I think it took me much longer to find coordinating Pattern paper than it took me to put together today's card using Sketch #59 from the Get Sketchy Blog. I took the easy way out Paper Piecing by using the wonderful coordinating Daisy Patch Die Cuts and Stamps from Heartfelt Creations. The beautiful paper is Webster's Pages, I used the MS Lattice Punch as my border. The Daisy and Sentiment are from Heartfelt Creations Daisy Patch Swirls, stamped in Chocolate on Vanilla card stock, then cut with Spellbinders Circle Dies. The leaves from the Elegant Single Leaves set are stamped in Olive on a scrap of Webster's Pages, then die cut with the Perfect Petals Die. To paper piece the Daisy, I used one of the Daisy images from the Daisy Patch Flowers set, stamped in Chocolate on a scrap of Webster's Pages. 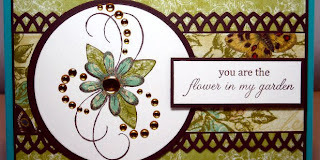 Adhere the Petals and Daisy over the stamped Vanilla panel, and add some Gems to finish off your card. Lovely use of the sketch! Love the pieced flower with the stamped and gem flourishes. Beautiful card! Really love this card! The gems are so perfect with that gorgeous stamped image. Beautiful papers and colors! Wow! A truly beautiful card! Love everything about it! The time spent choosing the paper was well worth it...this is lovely! Oooooooo, quite lovely! The gems just add an extra wow factor! I adore the colors on this card and the design of it is beautiful. The gems are a perfect addition and love the paper piecing of the flowers. Beautiful card!! !